100% Pure Emu Oil – 50 ml/ 1.69 fl oz. $36.75 | Nasobih | Nasobih Naturals Ltd.
A pure and natural emollient, Rub Nasobih™emu oil on affected area 2-3 times per day or as needed. When using as a carrier agent, apply emu oil before other topical creams. Apply the emu oil before Nasobih™ Nutra-Cream to enhance anti-aging effects, such as fine lines, wrinkles, and skin redness. For external use only, if pain or irritation occurs, discontinue use. 100% Pure Emu Oil (descented) Packaged in an airless pump to prevent oxygen from entering the container, preventing oxidation and rancidity. Nasobih Emu Oil is fully refined for the highest quality. To learn more about emu oil, read our blog on the home page. You can also get extensive information from the book “Emu Oil, An Ancient Remedy”. Copies if this book by Dr. Bill Code is now available to order on the Nasobih website. 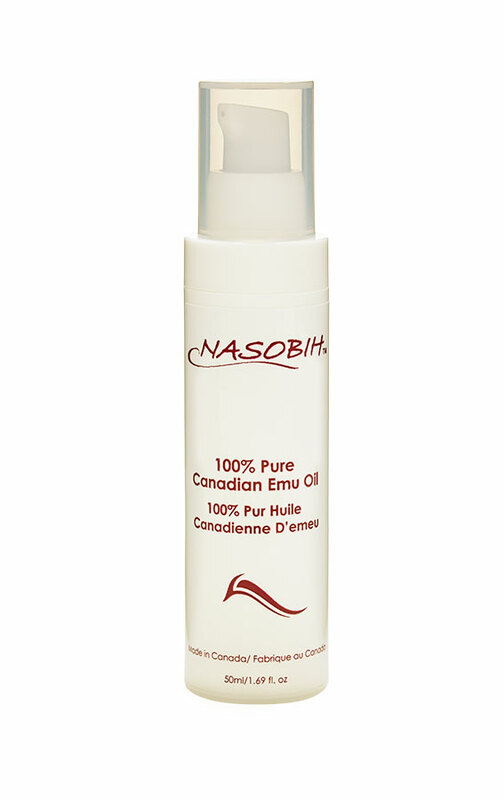 Nasobih™ 100% pure Canadian emu oil is obtained from an exclusive processor in the northern prairie region of Canada to ensure the highest quality and potency. Like deep water salmon, emu’s raised in colder climates have a higher concentration of omega-3 and omega-6 fatty acids then emu birds raised in warmer climates. Nasobih™ emu oil is extracted as a bi-product from the emu meat industry. Emu meat is very low in fat content and serves as a healthier source of protein from meat.